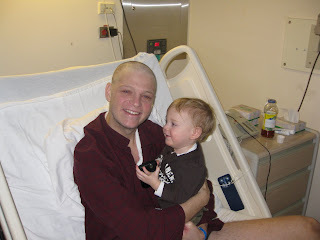 Many people have asked how they might be tested to see whether they are a bone marrow match with Brandon. This is so generous and we are so appreciative! There are bone marrow registries all over the world where people can volunteer as donors. At this time there are about 11 million donors internationally. If you volunteer to be a donor you can NOT specifically ask to be a donor for Brandon; you become one additional donor in the registry, and you will be called on if you are a match for anyone in the world. We do hope that you decide to donate in any case...if not for Brandon, then for another child, mother, husband, parent that is in need at this moment. Thanks to all those that have offered. Brandon is doing great today! We brought the kids in for a visit and Brandon was able to hold Koby and lift him up over his head, tickle Dana's back as she lay on the bed, draw some pictures together, laugh at Koby's little shtiks and give Dana a "monster hug". After the kids left Brandon walked around the unit and took a shower. 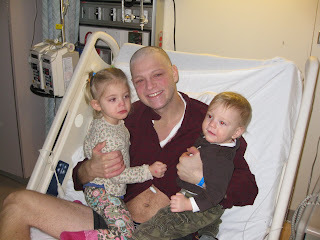 Dr. says he will probably come home on Monday and then return on Weds for a bone marrow test - the TRUE test to see whether or not he is in remission. We are praying to hear those words because the transplant can only be done in remission. Please keep those prayers coming!!! !